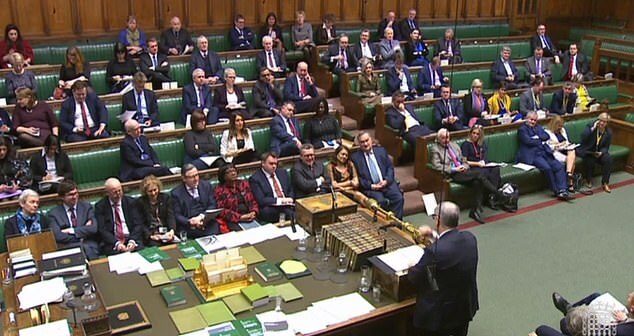 Attorney General Geoffrey Cox launched a searing attack on MPs planning to torpedo the Brexit deal today – demanding they stop acting like ‘children’. As the temperature rose in the Commons ahead of the crunch vote tonight, Mr Cox accused them of risking ‘chaos’ and ‘playing with people’s lives’. 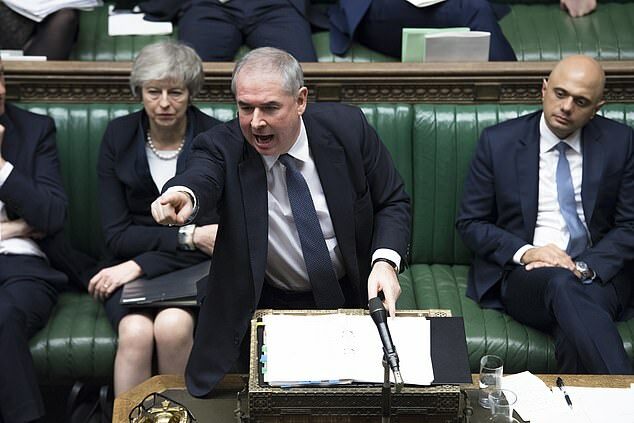 In brutal clashes, he fended off claims from Remainers and Brexiteers that the package thrashed out by Theresa May would be bad for the country. He warned them not to underestimate the legal complexity of leaving the EU after 45 years, saying the deal offered a chance for ‘order and predictability’. ‘It provides for the orderly and predictable and legally certain winding-down of our obligations and involvement in the legal systems of the EU,’ Mr Cox said. Mr Cox also used his bombastic speech to warn Remain MPs the UK cannot ‘pause’ the Brexit process by revoking Article 50. ‘If we do not legislate for that legal certainty as a matter of law alone, thousands of contracts, thousands of transactions, thousands of administrative proceedings, of judicial proceedings in the European Union and this country, will be plunged into legal uncertainty. ‘It would be the height of irresponsibility for any legislator to contemplate with equanimity such a situation. Mr Cox laid into Remainer calls for the process to be temporarily halted, insisting the EU would need ‘evidence’ that the country will not try to leave again. The eminent QC revealed his view after former Cabinet minister Ken Clark pointed to to the ruling by the European Court of Justice on Article 50. Judges concluded that the UK had the right to withdraw the Brexit notification unilaterally before the end of March, and keep the current membership terms. 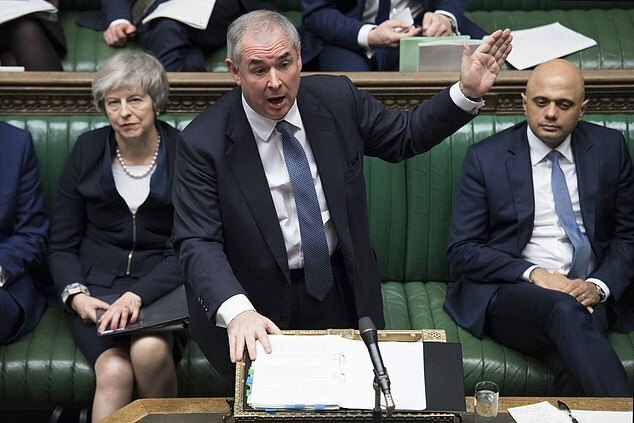 But Mr Cox told Mr Clarke: ‘We cannot revoke Article 50 unless we provide satisfactory evidence to the EU that we are cancelling our departure from the EU. Mr Cox – a strident Brexiteer – said he was backing the Withdrawal Agreement for ‘wholly pragmatic reasons’ as he opened the final day of debate before tonight’s crunch vote. Tory MP and leading Remainer Ken Clarke said he was being ‘pragmatic’ in supporting the PM’s deal ‘to minimise the damage’ of Brexit. And he accused arch-Brexiteers of ‘paranoia’ over claims the Irish backstop is some sort of plot to prevent Brexit. 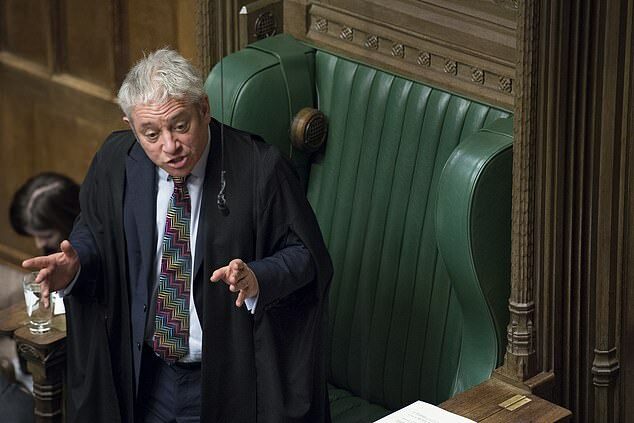 He said: ‘The Withdrawal Agreement in itself is harmless – the Irish backstop is not really the reason why a large number of members of this House are going to vote against it. ‘You have got to be suffering from some sort of paranoia in my opinion to think the Irish backstop is some carefully contrived plot to keep the British locked into European relationships which they are dying to escape from. Labour MP Rachel Reeves lashed the Brexit deal and demanded the Government rule out Britain crashing out f the EU with no deal. But Mr Cox replied: ‘She can eliminate no deal today, all she has to do is vote for this one. ‘And the reality is, it is the height of irresponsibility for the party opposite claiming to be a party of Government to plunge millions of our citizens into legal uncertainty of the type because of a factitious trumped up basis of opposition.